Few ridden horses can claim a record as consistent as Shaarinah. 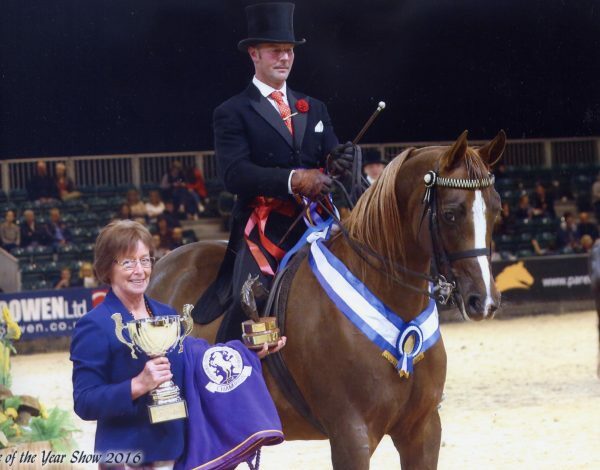 Partnered by David Froggat, the striking chestnut 13-year-old mare has countless titles to her name and this year added the accolade of Champion Arabian at Horse of the Year Show (HOYS). 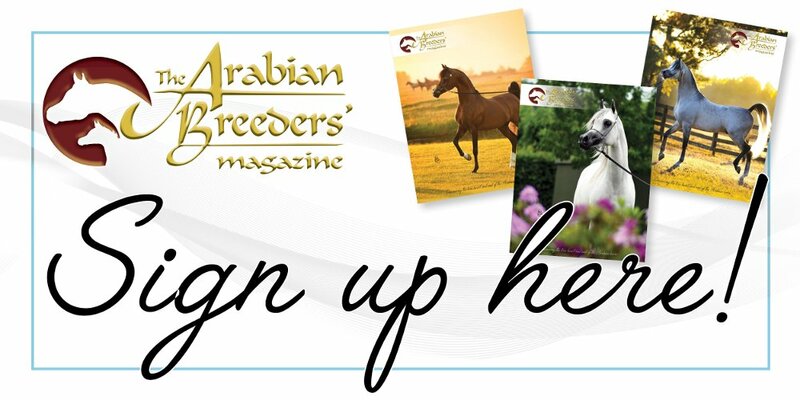 Having bred Anglo Arabs and warmbloods for many years, I bought my first pure-bred Arabian as a companion for an in-foal mare, a chestnut yearling filly who went on to do well under saddle before being sold on as a 10-year old. Two or three years, later I decided to look for another potential ridden mare; not an easy task when you live in Scotland. Eventually, I found a very raw, hairy chestnut mare in the far south of England who was exactly what I was looking for. Rising four, Shaarinah had size, substance and movement. Bred in Germany by Silvia Luggenholscher, she was brought to England as a late yearling from Sax Arabians. She is by the Elite Stallion Kais (Pakistan x Proba) and out of German Premium Mare Sherruka al Roban (FS Bengali x Shaburra al Roban). She was unbacked and had just weaned her colt foal, Sameon Marouhk (by Mareschal). Sharinaah went to Mel and Frankie Waring in Worcestershire where she was backed and she came out in the show-ring as a five-year old. She quickly de-noviced and as a six-year old, they qualified for HOYS. That same season, they took the Supreme Ridden Championship at the South West C Show. Shaarinah came home to Scotland for winter and I decided that I’d like her nearer home. The following spring, she went down to David Froggat in Lancashire, where she’s been ever since. In their first year, together they won the junior ridden mare class at the National Championships, the ridden mare class at UKIAHS, and she picked up their first Supreme Ridden Championship at the Northern Arab Show among other results. Between then and now, her successes include Supreme Ridden Championships at the British Arabian Championships, the Northern Arab Show, the Scottish Arab Show and North Staffs. In addition, Shaarinah was Gold Champion at the Ridden Arabian Star Series finals and won the ridden mare class at the UKIAHS three times, as well as taking Silver and Bronze Ridden Championship. She has been Reserve Supreme Ridden Champion at the British Nationals and qualified for HOYS every year, where she has previously taken second, third and fourth places. 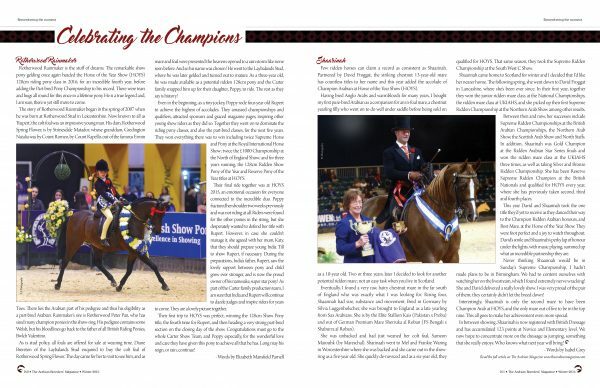 This year David and Shaarinah took the one title they’d yet to receive as they danced their way to the Champion Ridden Arabian honours, and Best Mare, at the Horse of the Year Show. They were foot perfect and a joy to watch throughout. David’s smile and Shaarinah’s perky lap of honour under the lights, with music playing, summed up what an incredible partnership they are. Never thinking Shaarinah would be in Sunday’s Supreme Championship, I hadn’t made plans to be in Birmingham. We had to content ourselves with watching her on the livestream, which I found extremely nerve wracking! She and David delivered a really lovely show. I was very proud of the pair of them; they certainly didn’t let the breed down! Interestingly, Shaarinah is only the second mare to have been Champion Arab at HOYS, and the only mare out of five to be in the top nine. This all goes to make her achievement even more special. In between showing, Shaarinah is now registered with British Dressage and has accumulated 123 points at Novice and Elementary level. We now hope to concentrate more on the dressage as jumping, something that she really enjoys. Who knows what next year will bring!